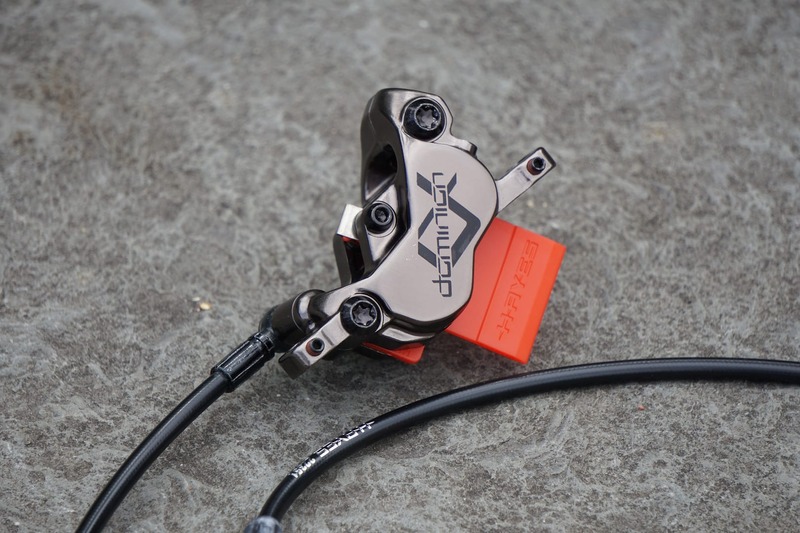 Hayes recently debuted a brand new hydraulic disc brake called the Dominion A4. 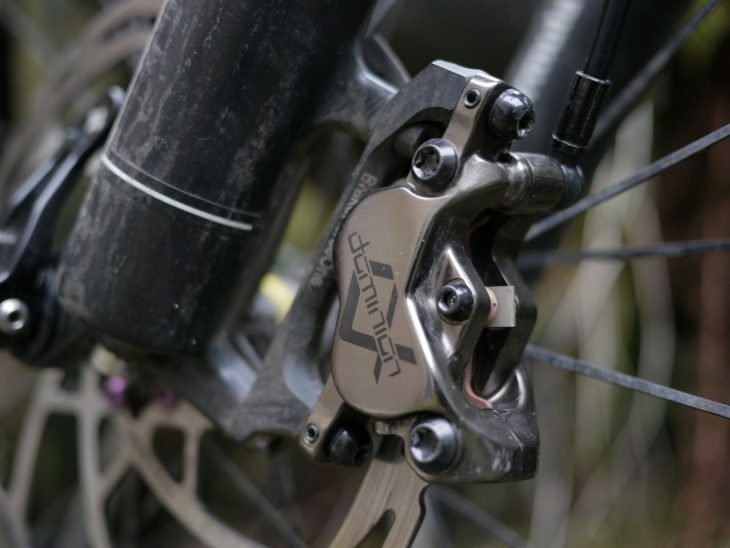 Designed as a powerful 4-piston disc brake for trail, enduro, downhill and e-MTB use, the Dominion A4 is an absolutely crucial product for the Hayes Components group. 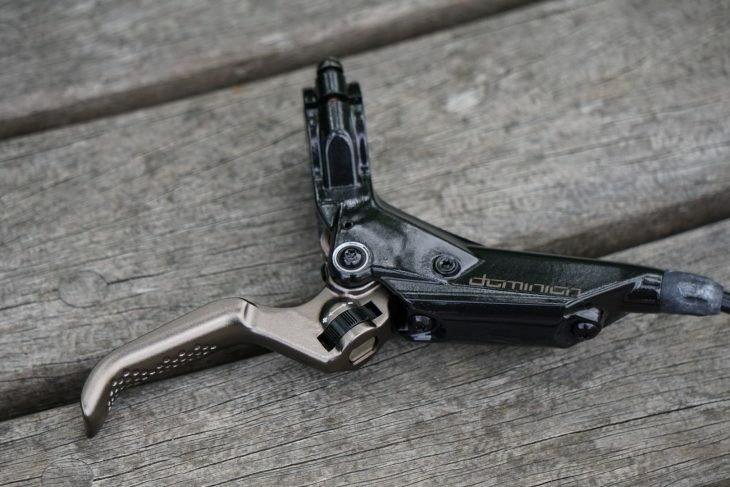 To see whether the Dominion delivers on expectations, we put a set of brakes into resident tech geek, David Hayward. Over to David! In recent years, when you asked “What brakes?”, Hayes wasn’t a name that came up that regularly. Despite popularising mountain bike disc brakes way back when, more recently they seemed to be surpassed by other brands. So, rather than increment their existing products, Hayes went right back to basics to design the Dominion A4. 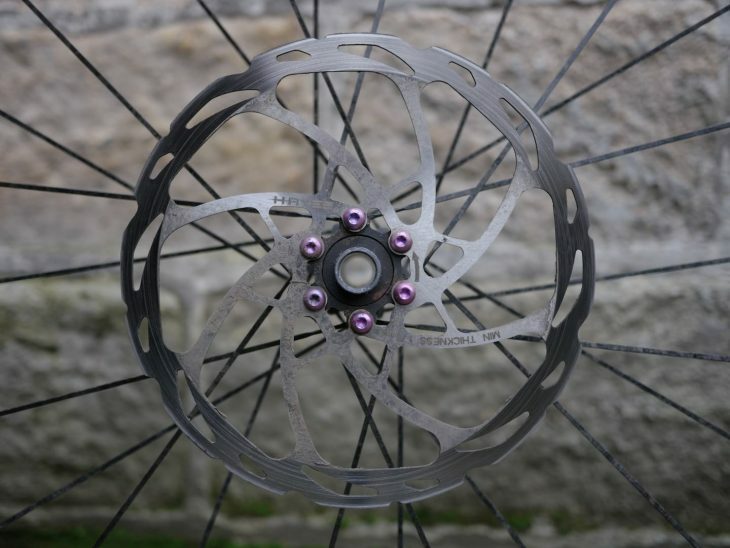 They built prototypes, gathered telemetry and feedback, then evaluated every aspect of a mountain bike disc brake from fundamentals up. The Dominion A4 is a brand new disc brake from Hayes. A four piston calliper and a single finger lever might not sound like such a different result, but the Dominions are packed with features, and don’t share much with previous Hayes brakes. Maybe the dotted lever texture, the split clamps, and the alignment system (more on that shortly). Apart from that, everything else is basically new. Let’s get straight into it. From the 4-piston callipers to the levers, these share very little in common with previous Hayes brakes. Split clamps make it nice and easy to install these or swap bars. 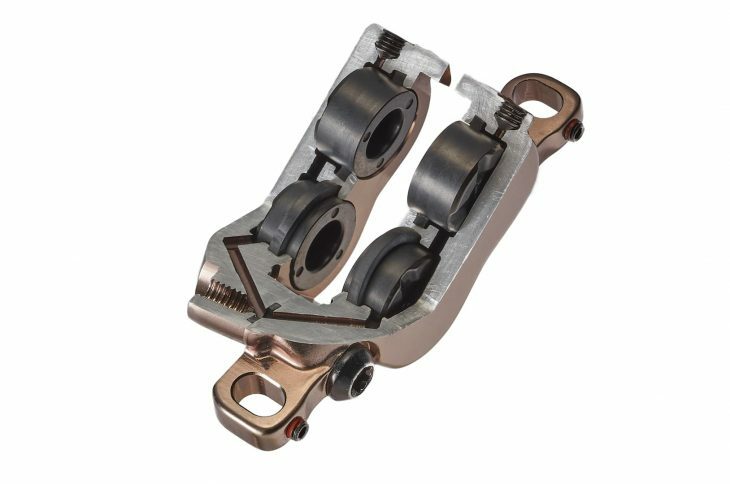 The finish quality of the brakes is high, with a deep bronze sheen to the callipers and lever blades. These had no scratches or rubs by the end of the test, not even where my fingers sat on the levers. Also, these brakes looked extremely fancy next to the 10 speed SLX/SunRace gearing setup on my hardtail. The lever blade is fairly tall, and features machined dimples for added traction. The lever blade is fairly tall at 15mm where your knuckle sits, though not the tallest. 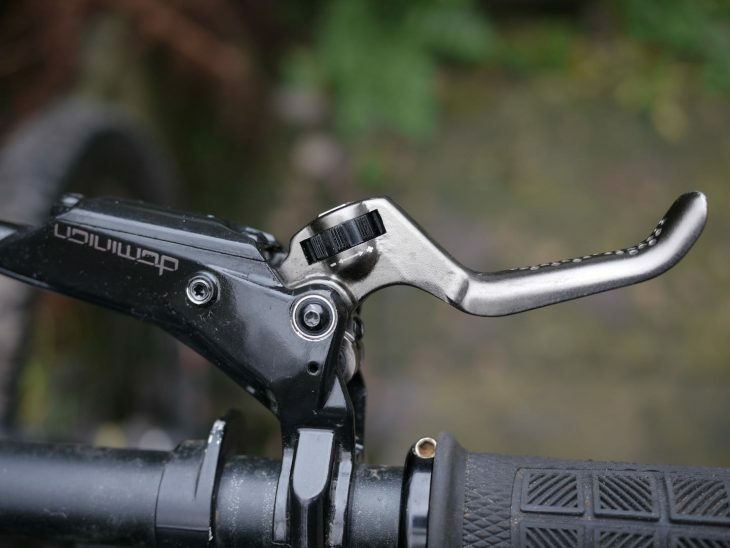 For comparison, Shimano levers are 13.9mm at this point, SRAM 14.7mm, and Magura HC levers 16mm. A millimetre here and there may not seem like much, but along with how rounded a profile the lever blade has, it can make a massive difference to lever feel. Since I’m used to Magura HC levers, these Hayes ones felt dainty but not too small. 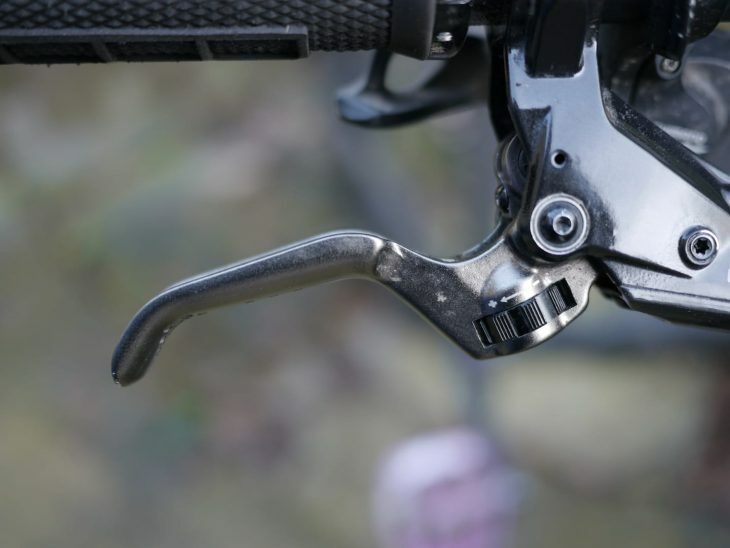 The levers have big, tool free reach adjust dials, plus a tiny hidden grub screw to set the dead stroke. Hayes recommend not touching the latter though, as it’s factory set to be minimal. They also run on bearings, giving them a very smooth and light action. 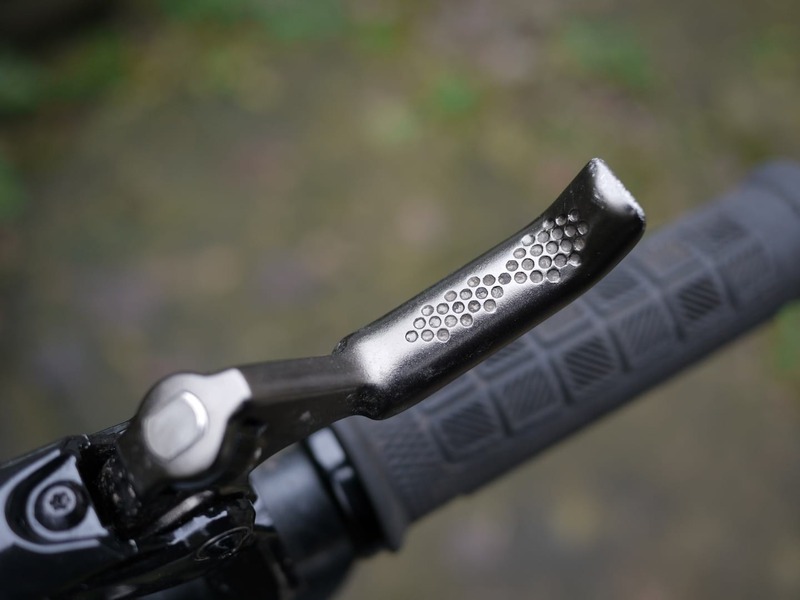 Save for high end SRAM, and Trickstuff, we can’t think of any other levers with this feature. 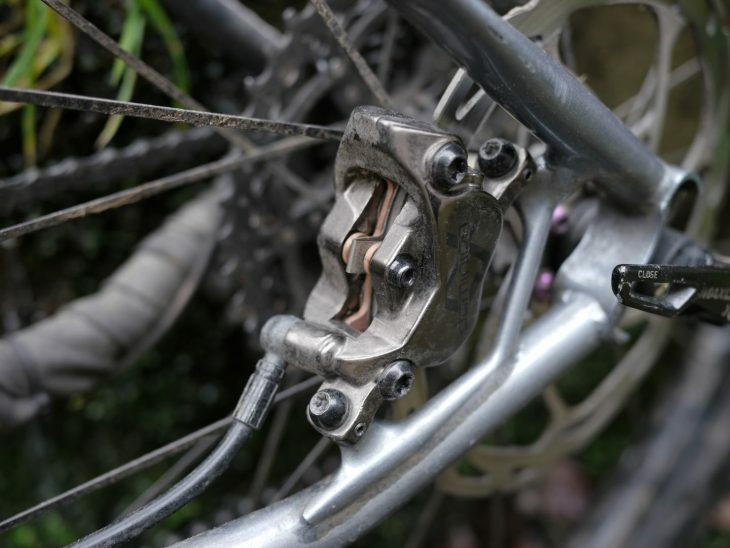 The cartridge pivot bearing helps to provide a smooth lever feel. Hayes disc rotors come in resealable bags (so you don’t have to eat a whole one), complete with a set of rotor bolts, so no annoying gotchas there. They measured between 1.93 and 1.97mm thick, and are marked “min thickness 1.7mm”, so have plenty of material to get through before they’re at any risk of exploding. I ran 180mm back and 203mm front, on adapters that were already on the bike. Hayes later sent some of their own adapters, packaging labelled in ‘murican, but the adaptors themselves are engraved with metric too (if metric bike measurements like 203mm and 31.6mm seem weird or arbitrary to you, they’re like this because they equal whole numbers and fractions of inches). Hayes has also developed new stainless steel rotors for the Dominion A4. At the calliper end, there are two tiny grub screws at right angles to the calliper bolt holes. These let you adjust the calliper position with very high precision, and Hayes call this their Crosshair alignment system. You know how sometimes, tightening a calliper bolt down that last bit can move the calliper just slightly? These little grub screws completely eliminate that, allowing a very precise setup and letting you get rid of even the slightest spot of rotor rub. I love this – between a thumb and an allen key, the calliper can end up exactly where you want it. There’s a tiny grub screw on the side of each calliper mounting bolt. This is the ‘Crosshair Alignment System’. These shipped with the hoses nice and long, and Hayes included a bleed kit with some extra compression fittings. I ran them for a few months with long hoses, then eventually got round to shortening them. The bleed port location on the master cylinder requires you to have the lever on a bar mounted at 45 degrees. Hayes also recommends removing the brake from the bike and mounting it on a spare handlebar held at that angle in a workstand. 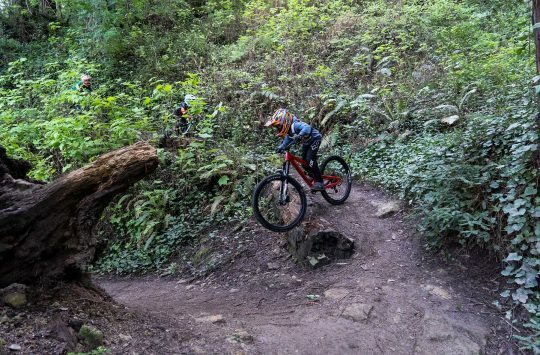 That’s easy for the front, not so much for the back, and would also be a no-go with internal routing. 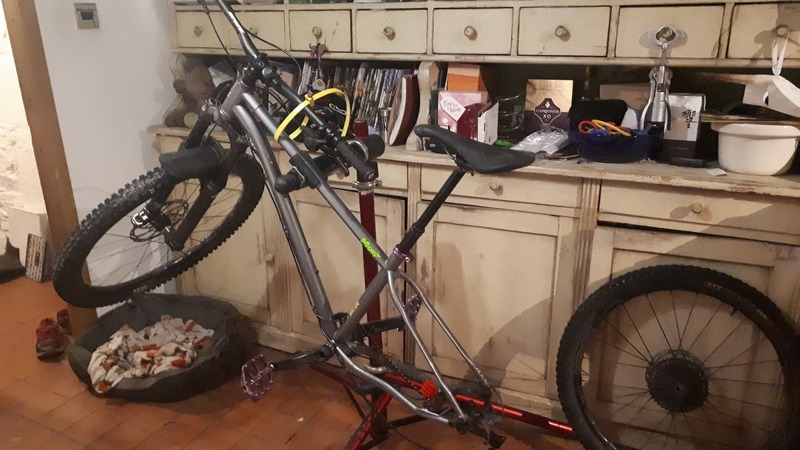 David shows that you don’t *have* to remove the brakes from your bike to bleed them. The standard bleed sufficed for me, but if you want to make sure your bleed is absolutely perfect, how’s this – there are actually two bleed ports on the back end of the caliper. 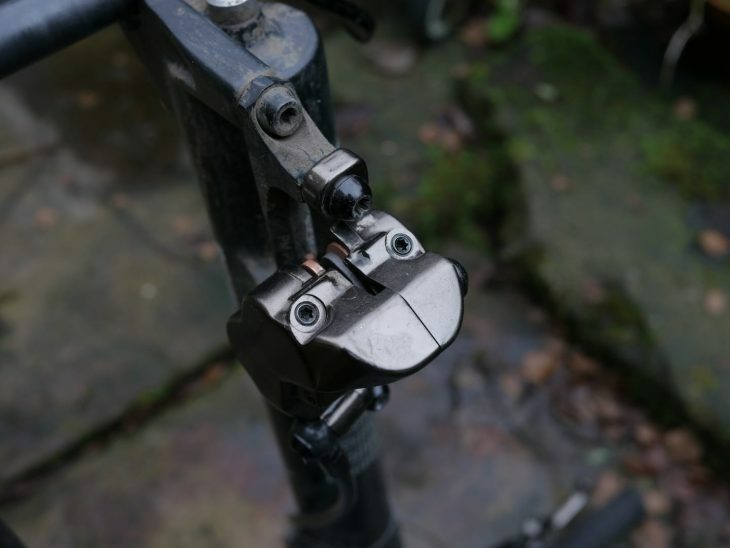 Simply perform a bleed as normal, replace the master cylinder bleed screw, and connect both syringes to the caliper to then guarantee no air bubbles hanging about anywhere in the system. Want the perfect bleed? You can bleed BOTH sides of the calliper. There are four 17mm diameter pistons inside each Dominion A4 calliper. The lever feel of these is really unusual at first, because the bearings make the action so light. Hayes describes it as “the sweet spot between wooden and spongy“, but that only became apparent on a moving bike. On first squeeze I worried it seemed way too soft compared to other brakes. It isn’t though, it just makes a lot more sense when combined with feedback from the calliper and wheel. They have low initial dead stroke, but it feels greater when you’re not moving and mash those levers. There is a little dead stroke, but it’s well optimised. You might recall our review of the first version of Brake Force One’s H2O brakes, which had so little dead stroke and so much power they felt like they could eject your pelvis. These Dominions have a much more balanced bite, along with a well designed power curve. They bite quickly, then provide a lot of predictable modulation, and in a pinch can still put down a lot of power very fast if you need it. 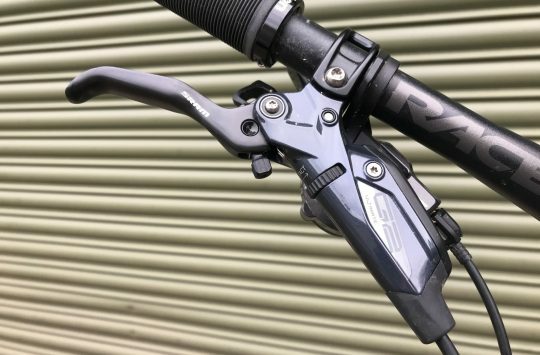 I’ve not ridden many brakes this powerful and refined, and they’re a big upgrade over most things you’ll find bolted to a retail bike. The dead stroke that is present is exceptionally light and smooth. On big rides, especially with long descents, the smooth lever movement was really appreciable in reducing arm pump and fatigue. While there’s a good amount of modulation, it takes very little finger strength to get them to clamp right down. Power is plentiful, making it very easy to dump a lot of speed in no time at all. That’s true even with sintered pads compared to the standard semi-metallic, though the sintered ones were a little squeally upfront until I’d done a dozen or so stops. Speaking of noise, Hayes also talks up their rotor and pad combo, saying it’s been tuned to get rid of harmonics and eliminate brake squeal. They’re not really exaggerating, and this was a very pleasing feature. While there was occasional squealing on wet rides, this was always after a standing start or big puddle, and wore off in seconds to leave the brakes quiet again. It’s been a blessed relief compared to some brake and rotor combos I’ve run that have honked and wailed their way down every hill. There is a ton of power on tap with these brakes. Toward the end of this test, I was running in fresh pads for these Dominions, some Magura MT7s, and some brand new MT5s. 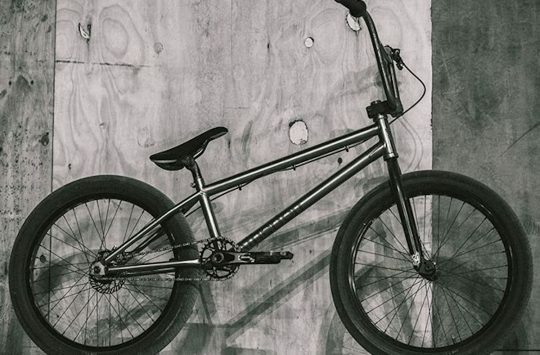 All three brakes are powerful enough to easily do accidental stoppies, but running them all back to back I noticed the Dominions had a much lighter feel even at that point, with noticeably less stress on my braking finger. I’ve struggled to find any downside or lack in the Dominion A4s. A few riders I spoke to about them didn’t like the look of the master cylinders, but I really don’t mind them. I thought the weight might be the one minor negative, but at 301g for the front & 317g for the rear (without rotors or adapters), they’re lighter than many brakes including most that are comparable in power, or any you’d find as OEM options. All told, these have been flawless, and the amount of power they can put down means they’re well suited to aggressive and/or steep riding. 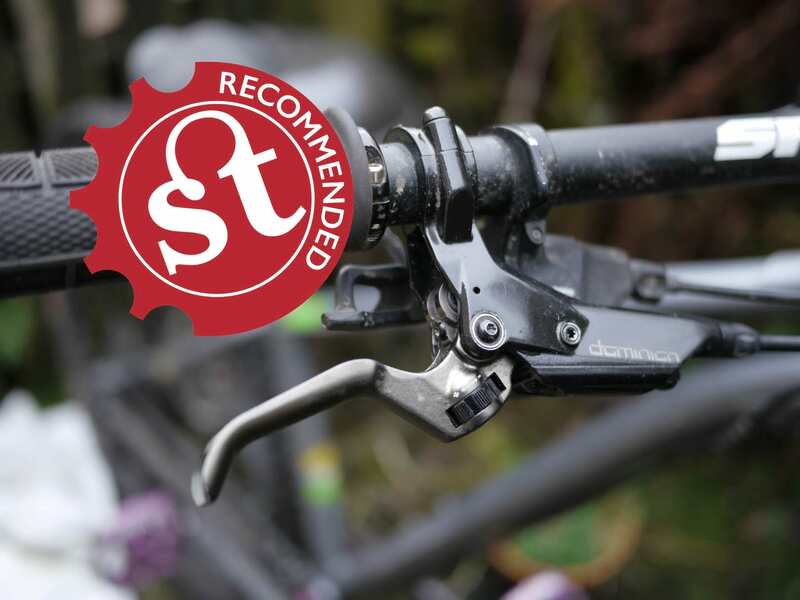 Impeccable reliability combined with modulation, raw power and the impressive lever feel mean the Hayes Dominion A4 brakes are some of the best we’ve tested. The Dominion A4s did not stutter once during the months I’ve been testing them. Smooth feel, easy lever action, plenty of power, good feedback, no fade, low noise, consistent braking. These are luxury brakes with an immaculate lever feel. They combine some of the best features from my favourite brakes, then add a few more to boot. Love the grub screw alignment feature. So many times I have been nicely aligned, just need that final tighten to torque and… boom 10 degrees out from 1/8 of a bolt rotation. £50 for a bleed kit is a joke. And they have just won Pinkbike component of the year.